For someone who lived east of Pittsburgh, prior to moving into the city, the Green Mango is one of the first restaurants you think of when you think of Thai food. With our February wine exchange about 4 weeks away, TasteBud A and I figured we should try it out as a possible location, so we went on Friday. We walked in carrying our wine bottle and were shocked at the fact the place was packed. Luckily we had called ahead for a table for two and we were sat right away, which likely disheartened some of the people waiting for a table in the entryway. The dining room of Green Mango is small. We may have had a table for two, but we were so close to the table next to us, it might as well have been a table for six. Luckily the neighboring table was a talkative group who frequents the restaurant and had some great suggestions for us. We hope to see them at the next wine exchange. For an appetizer, I selected a light option. 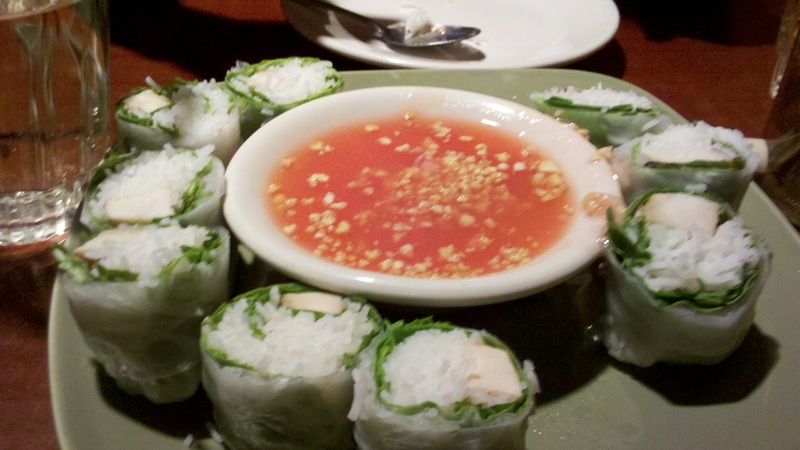 It was the Summer Rolls with Chicken. This appetizer comes with their homemade dipping sauce, which resembles a duck sauce but has more flavor. And although the flavor, isn’t distinct enough to identify what went into it, we enjoyed it. As for my meal I ordered the Spicy Prik King. When having Thai food, I often try to seize the chance to order spicier foods. The food arrived hot and with aptly cooked rice – not too fluffy and not too sticky. The meal certainly was spicy. It cleared any congestion I may have had and I was reaching for my wine and water to keep the food going. It was however, spicy with a ton of flavor. 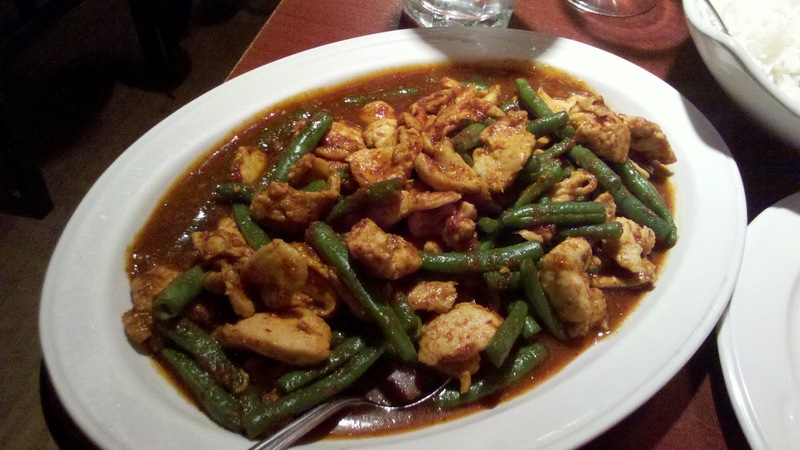 I could distinctly taste the chicken and green beans on the plate amongst the chili paste. The helping was a very large portion too. Being that I am trying to keep my portions reasonable, I happily took the rest of my meal to go. Although the food would have held up to TasteBud standards, the hustle and bustle of the staff to get us our food and get us out the door wasn’t encouraging toward wanting to host a wine exchange. Because the dining room was very small, we would require the Green Mango to close their doors to the public during our event.